If houses reflect the times they were designed in, mid-century modern is the architecture of ideas, created by those who believed that the forward-thinking and forward-looking style could be a vehicle for social change to create a better society. This residence is no exception. It is a floating glass pavilion over water, employing the purest of modern architecture with spectacular and panoramic city views. The living room consists of four over-sized sliding glass doors on a double-axis with terrazzo walkways symmetrically aligned, suggesting a highly refined modern Greek temple. The public rooms have high ceilings and each is a visual extension of the outdoor space beyond. 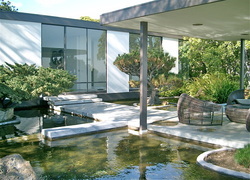 The property contains specimen trees, citrus trees, Japanese gardens and an outdoor viewing pavilion. Located on a hilltop above the city, this touch of Shangri-La is a quiet and serene retreat. The home was designed by Thornton Ladd in 1958 with a vision for a modern house utilizing the surrounding tranquil space and spectacular views. Many of Ladd’s signature design elements govern this property’s architecture and landscape - including horizontal and vertical planes, floating terrazzo walkways, intersecting walls and large-scale koi-pools. Thornton Ladd was born on January 29, 1924 and graduated from USC’s Architecture School. He was 34 and well into his career when he designed the Wolff Residence for his client, celebrated Los Angeles Interior Designer, Marco Wolff. Ten years later he designed the Norton Simon Museum in Pasadena. Here, Ladd’s design included its striking curvilinear shape and covered exterior of 115,000 handmade deep umber tiles. As the sun rises and sets, these tiles reveal their delicate tones and highlights. They serve as a reminder of Pasadena’s many Craftsman-style homes as well as the San Gabriel Mountains that tower over the city to the north. For much of his career he worked alongside John Kelsey as Ladd & Kelsey Architects. Ladd passed away on his birthday, January 29, 2010 in Ojai, California. His vision for architecture was unfailingly pure and unadorned, characterized with an integration with nature.